Kourtney Kardashian posted a picture on instagram wearing a George Keburia Single Strap Belted Crepe Mini Dress ($535.00), Commando Semi Opaque Tights ($34.00) and Gianvito Rossi Nica Patent Pumps ($895.00). Cierra Ramirez posted some pictures on instagram wearing the LPA Corduroy Button Up Dress ($1,68.00), Fashion Nova Love Me Kiss Me Tights ($9.99) and her Steve Madden Daisie Patent Pumps ($89.95). Jesy Nelson was spotted arriving with her bandmates at the BBC Studios to promote their new album LM5 wearing a Roaming Denim Cropped Jacket ($73.00) and matching Catch Up Denim Mini Skirt ($52.00) by Mistress Rocks, a Pony Buckle Belt ($40.00 – wrong color) and Medium Fishnet Tights (Sold Out) both from Topshop, a Gucci GG Straw Shoulder Bag ($2,167.99) and Saint Laurent Billy Eel Platform Ankle Boots ($1,695.00). Skai Jackson attended an event in Los Angeles last night wearing Alice + Olivia Fall 2018 (Not available online), Jenny Bird Faye Knockers ($80.00), Wolford Tina Net Tights ($61.00) and Steve Madden Kennedy Boots ($69.98). Olivia Culpo attended the 2nd Annual #REVOLVEAwards in Las Vegas wearing the NBD x Naven Trixie Dress ($178.00), Giuseppe Zanotti Darleen Clutch ($1,150.00), Calzedonia 20 Denier Seamless Totally Invisible Sheer Tights ($25.00) and Manolo Blahnik Tayler Patent Pointed d’Orsay Pump (Sold Out). Sarah Hyland attended the amfAR Gala Los Angeles 2018 held at the Wallis Annenberg Centering wearing a Philosophy di Lorenzo Serafini Twisted Hem Dress ($850.00), Commando Chic Dot Sheer Tight ($34.00) and Jimmy Choo Romy Velvet Pumps ($625.00). Rita Ora performed at O2 Academy Brixton last night wearing a custom-made Knit Off-Shoulder Bodysuit (Not available online), a Reversible Logo Bomber Jacket ($3,390.00), Logo Embroidered Tights ($200.00) and Logo Catwalk Boots ($1,190.00) all by Fendi. 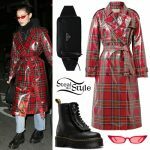 Gigi Hadid was spotted out and about during Milan Fashion Week wearing an Ellie Mae Elvis Presley Mugshot Jacket (Sold Out), Wolford Annie Tights ($67.00) under the Fiorucci Vinyl Jeans ($169.78), a Small Dual Tote ($1,940.00 – wrong color) and sunglasses from the Spring 2018 Collection (Not available online) both by Prada, and iRi Black Nubuck Boots (Not available yet). Kendall Jenner was spotted out and about in New York during Fashion Week wearing the Off-White Fox Fur Coat With Stole ($5,086.00), Alexa Chung Cutout Tweed Mini Dress ($525.00), vintage Prada Tessuto Mini Hobo Bag ($136.50 – pre owned), Topshop Forest Green 80 Denier Opaque Tights ($14.00 – wrong color) and Chanel Slingback Suede Cap-Toe Shoes ($1,095.00 – pre owned). Emma Roberts attended the Woolrich Yorkdale Grand Opening at Yorkdale Shopping Center in Toronto wearing a Woolrich W’S Cashmere Crew Neck (£225.00), a Saint Laurent Leather Mini Skirt ($2,390.00), Wolford Individual 10 Tights ($49.00) and Stuart Weitzman Rugged Booties ($357.00).